As July comes to a close, many of us know all too well that the allergy season is right around the corner! For many people, our Winix air-purifiers have been a great source of much-needed relief, as seen in their own words over at ProductReview.com.au So we decided to put together a few handy hints on how to get the most out of your air purifiers when it comes to those allergies. A reminder that as July comes to an end, so do our 'July Specials'. We've got some great deals on right now across our full Asthma Council Australia Sensitive Choice-approved air-purifier & dehumidifier range which just won't last much longer. So if you've been thinking about a purchase, now is a great time! 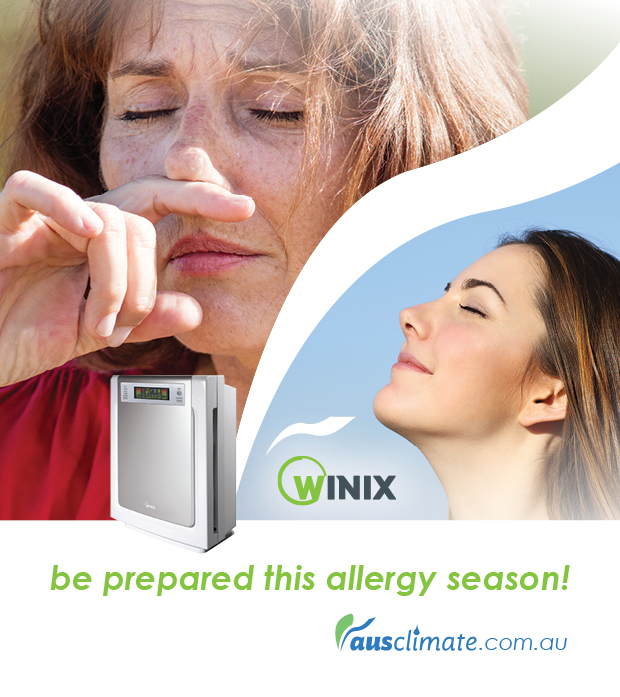 For those allergy & hay fever sufferers of us, Ausclimate's Winix air-purifiers can do an excellent job of reducing common allergens in the home like dust, dust mites, pet dander & pollens, thereby helping out big time in the fight against allergy flare-ups. To get the most out of your air-purifier for this use, we recommend running your unit on 'medium' in your bedroom while you sleep. Medium Fan speed is great to capture these allergens, while still nice & quiet for a good night's sleep. We also have a dedicated 'sleep mode' if you want it even quieter! As mentioned in our Air Purifier Cleaning Guide post, we also recommend regular cleaning maintenance of your unit as well as replacing your filter when the time comes to really keep your machine performing at its best when it comes to capturing those allergens! If you work in a workspace where it is convenient, we also find that running your air-purifier through the day while you work can do a great job of keeping those allergies at bay! Some have even said that they feel improved productivity through the workday with the cleaner air.